Contains powerful antioxidants, to help slow aging-process in your dog. We believe our dogs deserve real food, organic, healthy, all- natural dog treats .Our treats are all Wheat-Free, corn free and soy free. All our treats are optimized with Resveratrol 98%, pure Quercetin and vitamin C powerful antioxidants. Healthy and yummy combination of antioxidants. 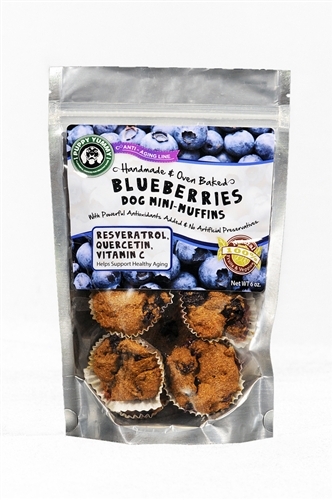 These Blueberries Dog's Mini Muffins are mouth watering dog treats that will get tails wagging. All natural, oven- baked, premium dog muffins are made with the finest, fresh, organic ingredients to ensure your dog's gets all the nutrition needed. Blueberries contain large concentration of anthocyanins, which are a type of antioxidants, that play an important role in fighting against free radical. 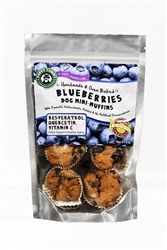 Healthy dog treats , flavorful choices. Ingredients:Organic Oat Flour, Organic Blueberries, Yogurt ( Grade A Pasteurized Milk, Cream, Non Fat Milk, Live and Active Cultures), Flax seeds, Honey, Organic Eggs, Extra Virgin Olive Oil, Pomegranate, Resveratrol 98%, Quercetin, and Vitamin C.
*Additionally, this product undergoes normal processes like any other human-baked good. Please handle with the proper care.